Greetings humanoids- check out these new vintage (oxymoron) wallpaper pattern vectors. 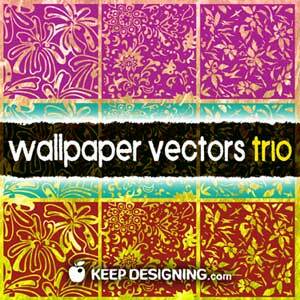 Today�s free vector download is a trio of floral wallpaper vectors.� There are three unique floral wallpaper patterns that can be used on anything from textiles to website designs to print graphics.� These three vector graphics were hand illustrated for your designing pleasure. These are copyright free artworks that can be used for any personal or commercial use.� The download zip file contains one eps that�s friendly to anyone running adobe illustrator eight or higher. Thanks for checking us out, come back soon for more free vectors and other creative design resources. cool!! thank you very mucho, amigo!! Used some old wallpaper stuff from here to create the image at the top of the page… THANKS! This is a really nice resource! I’ve added you to my top 35 Free Vector Image Sites! Thanks! Cool pack.. Thanks for these! Thanks, I can’t wait to use these!